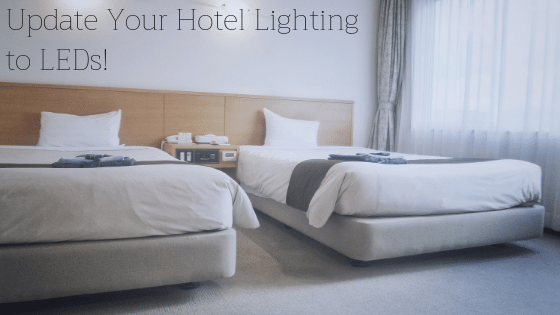 Update Your Hotel Lighting to LEDs! LEDs are a great lighting solution for any and every space. They are an especially great choice for hotel lighting, as they can improve your energy savings and the guest experience. Let’s cover a few benefits of installing LEDs in your hotel, as well as tips and tricks to create a great “home away from home” feeling for guests. As a hotel, you are dedicated to providing uniform rooms and experiences to all guests. Using fluorescent lighting in the lobby and restaurant and incandescent lighting in the rooms can lead to dim, dark, poorly lit areas that vary in look and feel. With LEDs, you can create a uniform look and feel throughout your hotel, with varying color temperatures for varying spaces, all while saving money! Hotels are large buildings with large energy costs. From individually temperature-controlled rooms to the sheer size of the building itself, power costs are steep. With LEDs, you can reduce your energy bill each month to save money. LEDs can provide the same amount of, or more, light than your traditional bulbs for a fraction of the wattage and cost! Hotel maintenance staff spends a lot of their time switching out burnt out bulbs, making sure the hotel looks kept up with. When using LEDs, your maintenance staff can get back to more important work, due to LEDs 15-20+ year lifespan! LEDs offer better, brighter light than incandescent bulbs. This helps create a modern, clean appearance for your hotel, instead of dark and dingy. Dimmers are a great way to create a flexible and personal experience for guests. LED lights installed with compatible dimmers allows your guests to control the lighting, whether they want bright, natural looking light to energize themselves for the day, or warm, cozy light to unwind. The great thing about LEDs is that they come in a variety of color temperatures. Your hotel can utilize brighter LEDs for overhead lighting and warmer LEDs for accent lighting, giving your space options. This can be useful in restaurants, lobbies, and guest rooms. When getting ready in the morning, brighter white LEDs in the bathroom are a great option. They help guests feel energized while they shower, brush their teeth, and do their hair. Bright bathroom lighting is also a great choice when it comes to makeup application! Find your LED Hotel Solutions at Sitler’s! Sitler’s is equipped to help your hotel make the switch to LEDs! Save money and better your guest experience at the same time with indoor and outdoor LED lighting. You can call us to schedule a free walk-through at (319) 653-2123 or request a quote online!